Muratlı Village is hardly the place you would expect to find cosmopolitan and open armed views about the intermingling of religions and global peace. 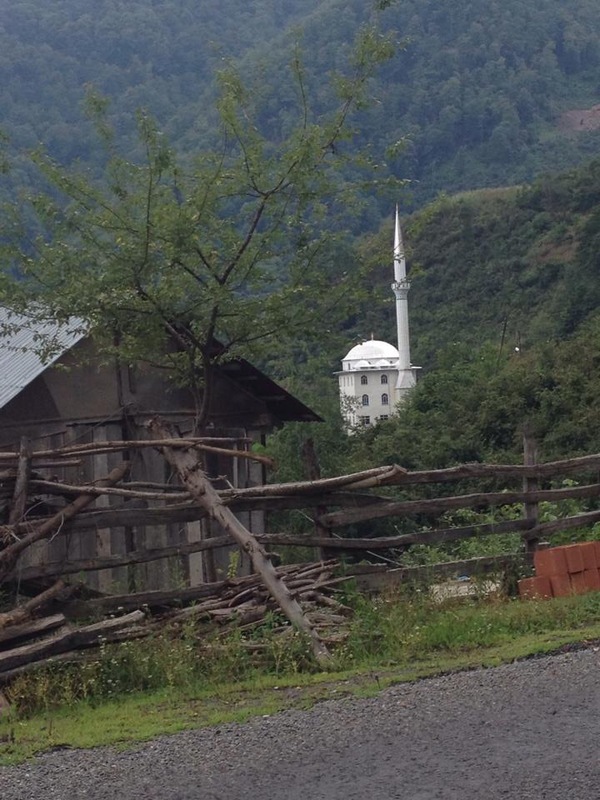 Muratlı (“muh-rat-luh”) is a truly tiny town exactly on the border of Turkey and Georgia. In fact, there is not even a crossing point into Georgia although the country is just in the town’s backyard. Quite literally. Always interested in driving to the edge and living on the geographical edge (i.e. Provincetown), we saw the name on the map and had to go there. I must say, the drive from Çamlıhemşin to Muratlı was a stunning one full of green mountains, tea plantations and twisty roads. But nothing prepared us for the wonderful Imam we would meet – and his special (albeit tiny) mosque. As with any visit to a mosque, we prepared by rolling down sleeves and wrapping up our heads. The ladies, anyway on the scarf front. We also locked Karagöz in the car just in case he were to make a scene or insult somebody on a whim. As we entered what Christians would refer to as the narthex, we were greeted with intricately carved wooden panels and doors. You can see some of them in these photos. As we entered the sanctuary, I was reminded of a circus tent upon looking at the inside of the dome…it was painted in an almost gaudy red, yellow and blue and augmented by a crystal chandelier as are so many mosques in Turkey. 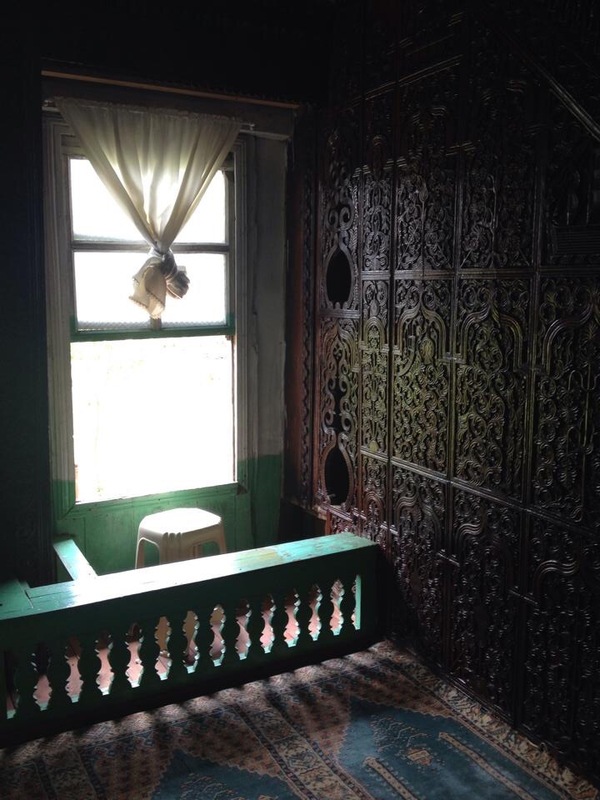 We heard the Imam discussing something with his congregants in the women’s gallery…but upon catching a glimpse of us, he excused himself from the ladies and bolted down the stairs to greet us. The spry and energetic man greeted us warmly and heartily, each one. I remember feeling surprised that he shook my hand and then feeling embarrassed that I thought that. I thought that that was probably a result of listening to Kenne, the queen of manners and maintenance of ladylike behavior puppet along with her handmaiden Zenne the nervous Nellie like a bowl of quivering jelly. Encouraging us to ask questions, he showed us through his beloved space. He was clearly a passionate and caring man. He told us that he was most proud of his mosque because of its physical statements in support of interfaith relations…not in so many words but this was the gist via translation. In order to support his point, he turned to the mosque’s pulpit. This was no ordinary pulpit – it was carved from deep brown, thick wood. And as we listened to our new friend, indeed, we could see the symbols he mentioned. Even more so, we could see the clarity and honesty with which he presented his pride about the pulpit…and what that must mean for this tiny town. A panoramic view of the village…not much there! This entry was posted in Cross-cultural learning moments, On Islam and Muslims, Puppets on the move around the world, Turkish Controversies, Turkish destinations, Visits from the Karagöz puppets and tagged Black Sea, cami, Christianity, faith, Georgia, Imam, interfaith, interfaith relations, islam, Judaism, Karadeniz, Mosque, peace, religion, Türkiye, Turkey, understanding. Bookmark the permalink. A poignant tale of a small rural town, in some ways like New England, with a good imam trying to stem the tide of hate, as are we all, and yet the tide rises. The photos, of the doors, the mosque in the woods (and it is even a wonder that you stopped to see it -), the ceiling, the town, are gems! As is the name of this town, reminds me of someone . . . There are mosques like this in so many places, and right here. Yet even Shields and Brooks are predicting that this incident will shrink the welcome in western cultures for Moslems, and life will be even harder for immigrants. Especially in France, where it has been harsh always. But even here. Yet there is also so much talk about Charlie Hebdo going too far – many US papers and networks will not show their cartoons. Which is to blame the victim, which is to sympathize with the bullies. And which is so hypocritical here, where you can shoot black men, even boys, for almost no reason, but you can’t cartoon them. Simon Shama said this morning that irreverence is an essential practice in democracies, and I agree, reverence and righteousness are cloaks many wear when doing evil. Real reverence and real righteousness are not chosen attitudes, but come upon us in moments when we see the good that lights the world, and honor it, as you did, in this small border town. Thanks for the words that came from you today, more a help to us than the puppets’ voices, which always need us to treat them as small children who want attention. Your own wise, adult voice is a gift. . . he was/is a voice of reason – unlike the nasty, racist content of the rag Charlie Hebdo that passes for satire. There is no excuse for violence from individuals or the instruments of state towards anyone. That said, when you deeply offend 1.6 billion people deliberately and then taunt them to do something about it it amazes me that only three did so. Thank you for sharing this, Nancy! Great points on this situation that helped me to refine my thinking, thank you, Alan. Thank you so much, Nancy, for your thoughts here. I thought you might appreciate hearing about this experience we had last summer. You have helped me to refine my thinking on the Charlie Hebdo topic, and for that I am grateful.